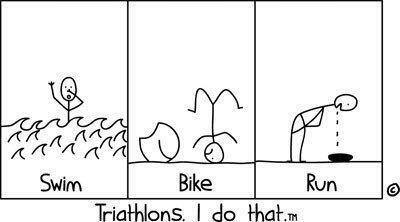 Many of our club members are keen open water swimmers and triathletes. Here is a quick summary of our summer achievements. The first event on the summer season calendar was the Sri Chinmoy Triple Triathlon on the 15 November 2015. This involves swimming, running and cycling around Canberra’s three lakes (although the Tuggeranong leg was in the pool!). Brenda Day’s team (“The Tearaways”) broke the record for over 60′s with some of our team in their 70′s with Brenda swimming tow of the three legs – 3.5km & 1.2km. Caroline Makin, Nicolee Martin, Lisa Moore, Suzie Gunning and Petrina Quinn were also in teams at the event. The Coogee Island Swim was held on 29 November. It was an extremely challenging swim and was quite exhilarating pitting yourself against the elements … Anne Smyth (1st F55-59) and Petrina Quinn (14th F55-59) were our brave swimmers! On the same day back in Canberra the 29th National Capital Lake Swim was held with a smaller turner than usual from our club members taking on the 9km distance in LAke Burley Griffin. Caroline Makin and Nicolee Martin paired up as “The M&Ms” and finished 1st female team and Kyle McLean and David Bale paired taking out 3rd place in male team event. The brave solo swimmers were: Lisa Moore 2nd U50 female with wetsuit, Paul Hitchman 9th U50 male, Greg Gourley 6th 50-59 male. On 17 January 2016, our ever favourite Tathra Wharf to Waves event was run in beautiful conditions on the south coast of NSW. As usual it was a great event to support. Our small team swam well with some podium finishes. Tom Boyce (10th Open Male 1200m), Caroline Makin (2nd F40-49 600m, 10th Open Female 1200m), Petrina Quinn (9th F50-59 600m, 37th Open Female 1200m), Tara Olsthoorn (2nd F30-39 600m, 11th Open Female 1200m), Mandy Coggins (3rd F50-59 600m ), Brenda Day (2nd F60-69 600m ), Jodi Burke (13th F30-39 600m, 35th Open Female 1200m), Lisa Moore (21st Open Female 1200m). Australia Day saw Nicolee Martin completing the iconic Sydney Harbour Swim taking out 3rd place in the F50-59 category. This spectacular swim was certainly a highlight for Nicolee and a wonderful event to do on Australia Day as a few of our swimmers know from previous years. On 31 January in Canberra, Nicolee Martin and Caroline Makin completed the ACT Triathlon Olympic Distance Tri (1.5k Swim/40k Bike/10k Run). They had great support and encouragement from the sideline from their hubbies and friends. A huge achievement and a first time ever for that distance for Caz! Tara Olsthoorn took part in the Diamond Women’s Triathlon Festival in Canberra in a Sprint Distance Tri (750m Swim/20k Bike/5k Run) as a member of the 1st place team doing the swim leg (2nd fastest swim leg overall). She also competed in the Canberra Proximity Corporate Triathlon on 27 February (300m Swim/9k Bike/3k Run) and her team placed 2nd with Tara achieving the fastest swim leg. 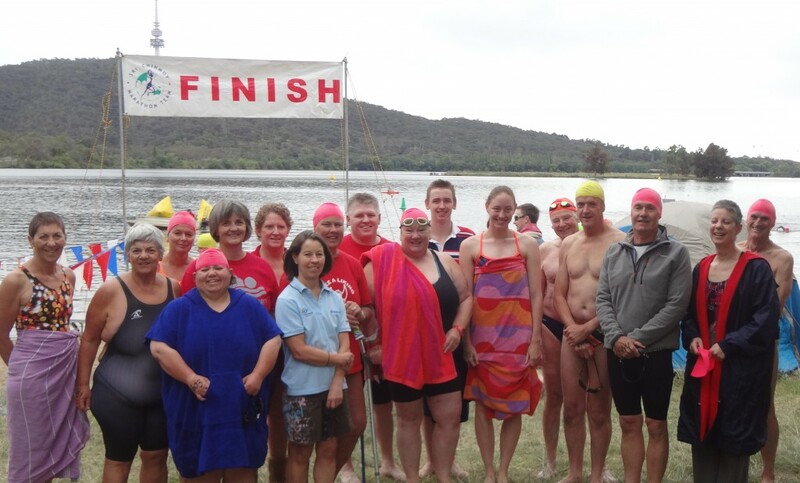 The next major swim was back in Canberra with the Sri Chimnoy Lake Swims on21 February. As usual, the club had a huge turn out for this event and we were joined by swimmers from Molonglo, Ryde and even a Queensland Masters swimmer! It is always good to support local swims so this is another event to keep in mind for next year. It was a shame it clashed with the Husky Triathlon, otherwise we would have had even more competitors. 5km – Greg Gourley (M50-50 2nd), David Bale (MU50 8th), Ben Freeman (MU50 1st), Jenna Freeman(FU50 1st), Petrina Quinn (F50-59 2nd); 2.5km –Anne Smyth (F50-59 1st), Jenny Bruce ( FU50 17th), Ian Hampton (M60-69 4th ), Suzie Gunning (F50-59 5th) , Ann Reid (F50-59 2nd), Jeanette Droop (50-59 3rd), Deborah Johns (F50-59 7th); 500m - Leisa Cass(2nd). On 7 February, the Cole Classic was run at Manly. It was a huge event with over 3,000 competitors and definitely an event to flag next year if you are thinking about doing some open water swims. 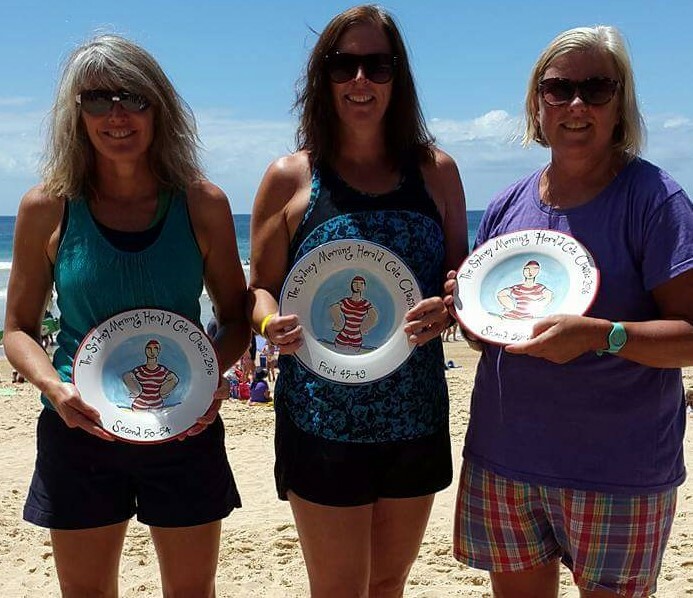 Caroline Makin (F45-49), Nicolee Martin (F50-54) and Anne Smyth (F55-59) swam the 2km event winning 1st pace (Caz) and 2nd place in their age categories. 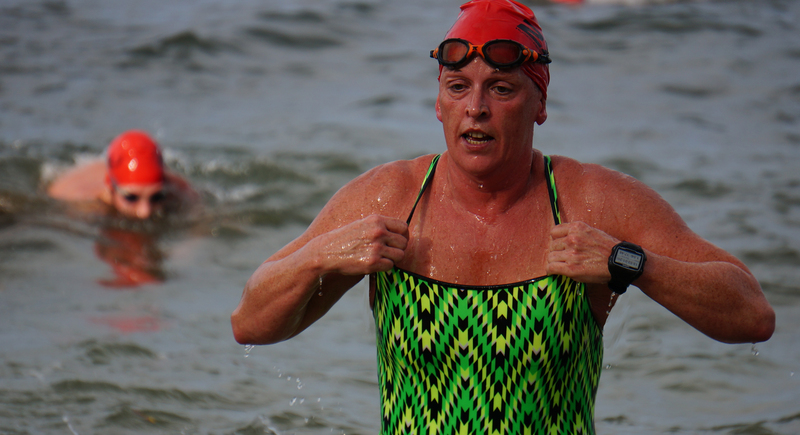 Iron woman,Deborah Johns, swam not only the 1km but also completed the 2km swim! So while our swimmers were splashing in Lake Burley Griffin some our hardy club members were at Huskisson competing in a huge Triathlon event – The “Big Husky” Triathlon Festival. This started on Friday evening with an Open Water Swim (1km) with Caroline Makin and Nicolee Martin winning their respective age groups. 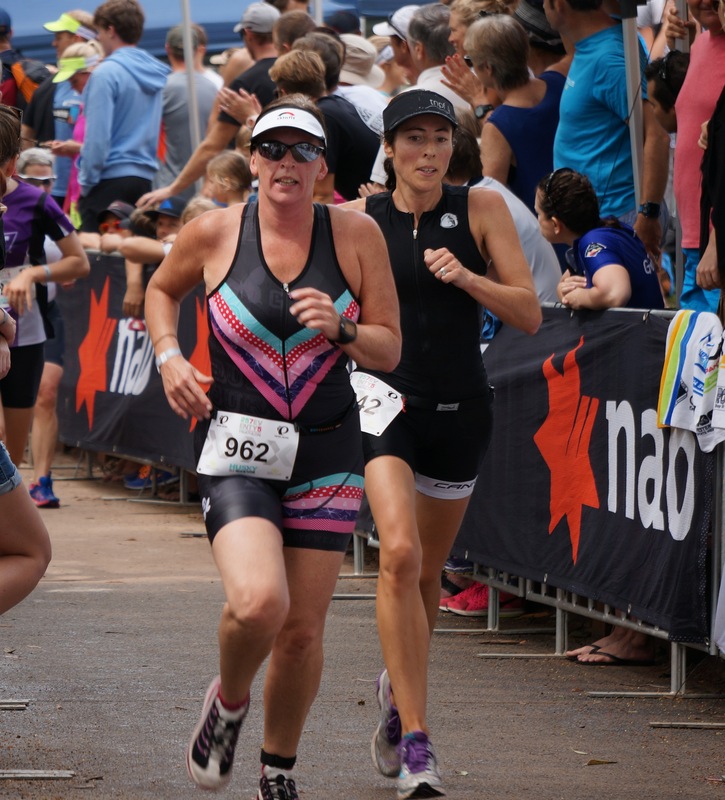 On the Saturday Caroline, Nicolee and Jill Blomeley competed in the Sprint Distance Tri (750m Swim/20k Bike/5k Run). Caz and Nicolee both finished in a fantastic 8th position in the age categories from a large number of competitors. Great to see Jill back competing! Then to finish off the Sunday, the “THE TRI NATIONS” team (English, Scottish and Aussie!) 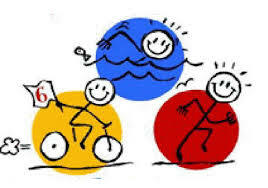 – Caz + Scott Makin + Dwayne Currie (Lisa Moore’s partner) – completed the Long Course Tri (2k Swim/83k Bike/20k Run). A huge sporting weekend! The Rottnest Channel Swim was held on 27 February. This is a 19.7km open water swim between Cottesloe Beach and Rottnest Island in WA and is one of the iconic swims in the world. Two of our newest and youngest members completed this swim with Ben Freeman winning the solo swim and his sister Jenna coming 4th in the solo females. A huge effort from both of these swimmers! The Broulee Bay to Breakers swim was held over the Canberra long weekend on 13 March and this event seems to be grow annually. Now this is definitely one you should consider for next year. It can easily be done as a day trip from Canberra and the swim is lovely. The water was so clear this year you could see fish and beautiful rocks while swimming!! We only had 3 swimmers here with Anne Smyth finishing in 2nd place, Suzie Gunning 4th and Petrina Quinn 15th in the same F50-59 age group. Deborah Johns also swam in the Melbourne Swim Classic (2.8km and 800m) on 13 March and the Tilbury Classic held in Nowra on the Easter weekend on 26 March. Well done to all our swimmers! There are a few more who competed in events over summer but we don’t have all information to hand. These swims may give you some inspiration for next summer season and something to aim for! You can attend an open water clinic with Andre Slade at Bondi Ocean Fit if you want some tips. Anne did one of his clinics last year and it was very helpful. You can tie in one of his clinics to a swim in Sydney and make a weekend of it! The Husky Long Course Triathlon Festival weekend has become an annual pilgrimage for some members of our club, and 2015 was no exception. This year Atsuko McGowan, Caroline Makin, Nicolee Martin, Leah Newman, Lisa Moore and Dwayne Currie all headed to the coast on the weekend of 20/21/22 February 2015 to enjoy a fabulous weekend of racing. The 10th anniversary festival kicked off with the 1km ocean swim event on the Friday evening in which Caroline finished second female overall and first in the F40-49 age group in an excellent time of 14.00, despite the quite challenging and choppy conditions where the return to the beach sent the swimmers through the rocky headland at low tide! Leah came a very credible 16th out of a large field of 33 women in the same age group in a time of 18.30. Saturday morning dawned hot and muggy after the over night rain but this did not deter Caroline who lined up with the other 580 women raring to go in the sprint distance triathlon event (750m swim, 20km bike, 5km run). Caroline had another cracking swim (without wetsuit) and was out of the water 3rd in her age group behind two top level female triathletes wearing wetsuits and went on to have a really solid ride and strong run to come home 26th in her age group in 1:30:42 which was an 8 minute PB compared to her race in 2014. 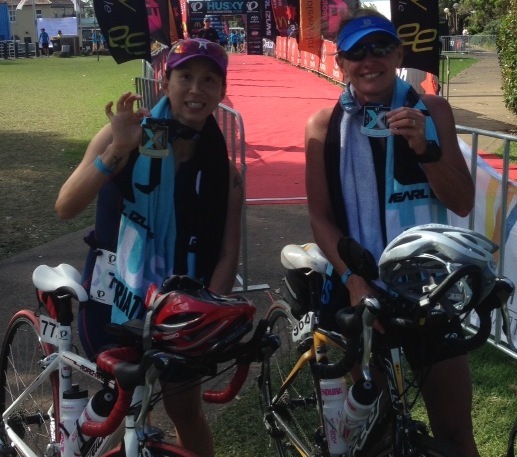 Finally, A tsuko & Nicolee joined 265 other crazy women alongside Lisa & Dwayne (in a 3 person team with their friend Dave on the bike leg), for the long course triathlon event (2km swim, 83km ride & 20km run) on the Sunday morning. Nicolee’s husband Steve, an experienced endurance triathlete, was also participating as much needed moral support for Nicolee along the course. 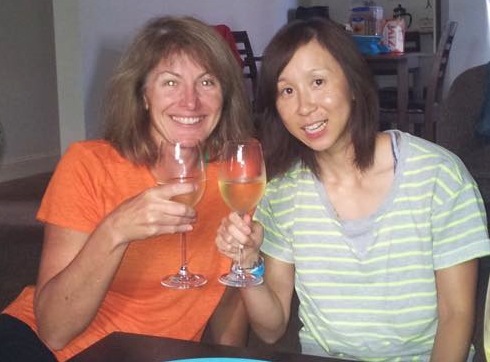 Atsuko (finishing in a time of 6:10:59 and 45th in the F30-39 age group) and Nicolee (finishing in a time of 6:27:18 and 36th in the F40-49 age group) found the course quite tough, especially in the hot and increasingly windy conditions during the run leg, but they were both happy to finish and were a little teary having achieved such a big goal. Lisa & Dwayne’s team (the “Uber Somethings”) finished the course in a fabulous 5:06:49 with Lisa swimming a terrific first leg in 28:52 and Dwayne completing the run in 2:01:07 to come 28th out of 75 mixed teams! It was an action packed weekend – well celebrated with lots of beer, wine and champagne across the Friday, Saturday and Sunday evenings… think about putting it on your list of must does for 2016 if you fancy a triathlon challenge and a fun weekend away! 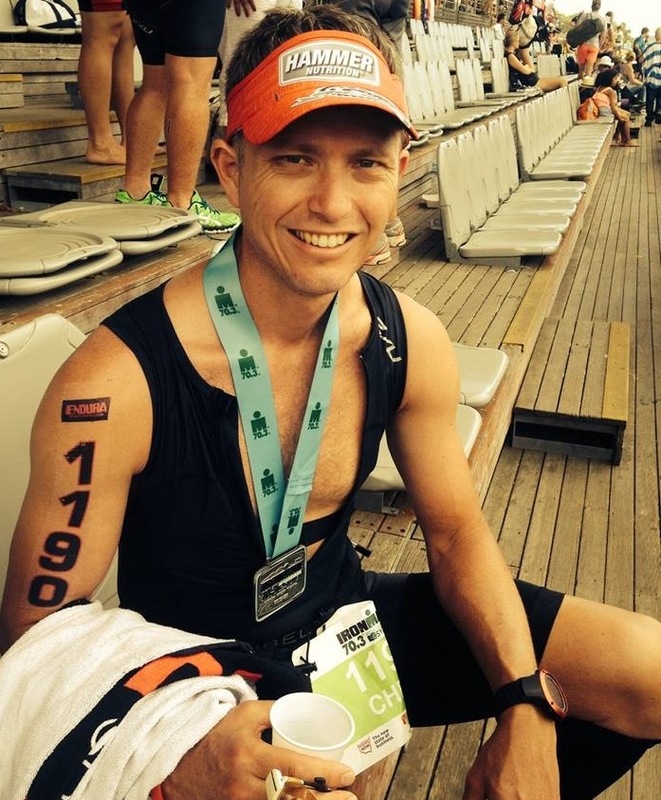 The Western Sydney Ironman 70.3 (also known as a Half Ironman) was billed as being fast and the word on the street was that is was going to be hot – the event delivered on both accounts on Sunday, 30 November 2014. The swim was deemed non-wetsuit as the water temp was 26 degrees, which suited the ‘real’ swimmers amongst the competitors including Chris. At the deep water start line there was a bit of panic amongst some competitors, with one needing assistance right behind Chris – he and a few others helped him onto the surf ski, then the starter blew! It was a crazy start. Chris’ 2k swim was ok, coming out in 36 mins, in the top 25% overall. Straight into the 90k bike leg, which promised to be fast. It was, with a very flat course and good surface for the most part. A little cramping at 70k and he backed off a little and took on extra electrolytes to set up for the run. Bike time of 2 hr 46 min average 32.44k/hr. Then the run. At this stage, Chris was feeling pretty ‘fresh’, so pushed on for the first few k’s at a good pace. Then the 36 degrees heat (close to 40 degrees out on on course) got to him – with lots of walking then running, the half marathon took about 40 mins longer than he had hoped, with a slightly upset tummy as well for the first 10k. An overall time of 6 hr 5 mins and Chris was happy that he finished pretty well unscathed. A lot of people stopped on course from cramping, collapsing etc. It was a good first attempt and he’s already planning his next one, where he will make a few tweaks to things. Chris thanks Anne, Leisa and the other coaches for helping him with his swimming. Just over a year ago, Chris could barely swim 400m without stopping and was consistently in the bottom 10% where now 2k seems relatively ‘easy’ and he is coming consistently in the top third. He hopes to improve this further! Chris is planning on a few ocean swims this summer and some more training to get him in shape for those.